The Scarpa TX Comp is the stiffer version of the Tx Pro. 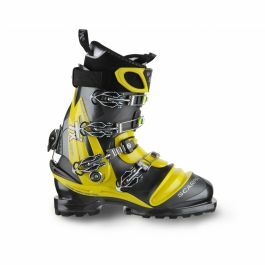 Designed for hard skiers and racers,they have a solid forward flex and excellent fit suiting low to medium volume feet. With very good heel hold and lateral stiffness they are a good choice for telemark skiers who want the best downhill performance for racing and piste. They have a walk mode for hiking and skinning giving the flexibility for some telemark touring. The Scarpa TX Comp are a performance boot for the telemarker who wants to charge. We strongly recommend that the Scarpa NTN TX Comp boots are fitted with a sport foot-bed and custom fitted by a skilled boot fitter. Please call 01943 816011 or email info@backcountryuk.com for an appointment. All ski boots fitted by us carry a boot fit guarantee.